While the ideal way to hold your handlebars is light and relaxed, like many of us, when I’m bombing down a descent (often way in over my head) I sometimes unconsciously death-grip my bars. My Ergons allow me to succumb to that occasional death grip without beating up my hands and wrists. Some folks, including my girlfriend and a few of my teammates, prefer the Ergons with the integrated bar ends, though I prefer the ones without because I fear those narrow trailside trees that have been known to jump out and grab you off your bike. Plus, I find that even without the bar ends I can place my hands on the fat end of the grips to mix-up my hand position to keep my hands fresh and light. Positioning is essential. One important part of enjoying your Ergons is to bring your hex wrench with you on a long training ride and continue to tweak your grips until you find the sweet spot that makes you most comfortable. Mine are currently at about a 150 degree angle (pointing slightly up toward the rear of my bike). Make sure you sufficiently tighten them so you don’t accidentally twist them on a big drop…that’s never a pleasant surprise, though don’t over-torque them so they strip. I prefer the GP1 large model because I have big hands, though you can shave a few grams by using the GS1 instead. Come to my favorite bike shop, Spokes,Etc. on Quaker Lane in Alexandria, VA to purchase a pair or two. Give one to your buddy for a thoughtful yet inexpensive gift. The important concept is to decide what works best for you. And because other folks prefer something, doesn’t mean you shouldn’t go against the grain. Paul, Barry, and Cathy work the cadence. The GOALS Krista Griesacker Memorial is an annual adventure race in honor of Griesacker, an avid adventure racer and search and rescue instructor who passed while training a few years ago. At 7 AM on a Saturday, teammates Paul, Barry and Cathy lifted off from the Civil Air Patrol Search and Rescue School in Hamburg, Pennsylvania. 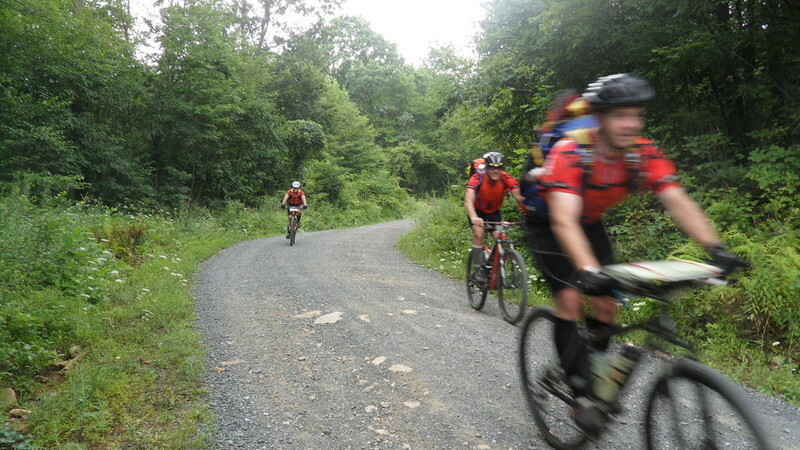 And for the next twelve hours, the team tackled 20 miles of trekking and orienteering, 5 miles of paved biking, 14 miles of mountain biking, 7 miles of canoe paddling as well as rappelling and fun team challenges. Cathy monitored the teams pace. She admittedly hadn’t trained for the event. Paul and Barry cajoled her to race 36 hours before start. Barry (par usual) raced against doctor’s order, and Paul, fresh off a race the weekend before, reluctantly assumed the mantle of navigation. Even though there were many nerves on everybody’s part, everyone kept their cool and didn’t over heat. A good pace for everyone was found and the team always kept moving. The lingering image of the race was the team trudging up the fire road to Pulpit Rock in blazing afternoon heat, along with watching Paul use ascenders to climb up the tower at the end of the race, despite being completed exhausted. The lowest point for the team came early when we realized that we’d missed the first upstream paddlepoint to start the race. However, together we managed to turn the frown upside down by putting the mistake behind us and having solid navigation the remainder of the day. The highest point for the team was Paul naving us to basecamp SPOT ON after a 1.5 km, 1000+ft bushwhack descent from the top of Hawk Mountain. We truly worked as a team sharing food and encouragement, and Barry played the role of team mule by carrying my pack and Paul played the role of team brainiac by thinking to bring trekking poles. All that training pays off. C'mon Cathy! Teamwork gets you over the wall. Don’t over pack food; bring food and meds, electrolytes to share, and encourage people to eat and drink regularly. Keep an eye on each other, and remember you are out there to have fun. In terms of discipline-specific lessons from the race: canoe – never pass a checkpoint, trek – keep moving, bike – map boards rock! Believe that you can do more than you think you can. Remember no matter, how good you feel, you are going to feel worse, and remember how bad you feel, you are going to feel better. 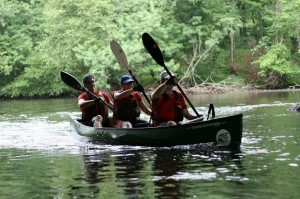 Be optimistic; enjoy the scenery, the ride, the paddle, the jokes and the camaraderie!